Rumors have taken over the NFL as we take on the home stretch before the Oct. 30 trade deadline, putting the future marquee players like Patrick Peterson, Le’Veon Bell and Kelechi Osemele in limbo. 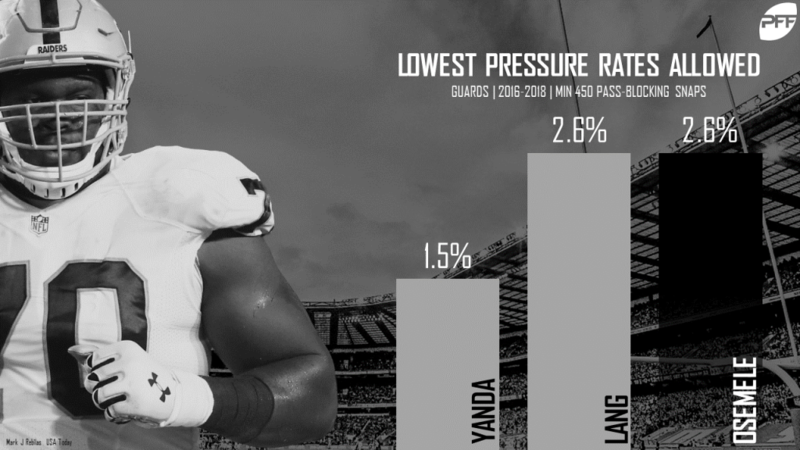 As a result, PFF’s team of analysts have decided to seek out ideal landing spots for all of the NFL’s big names involved in trade rumors as of late. At this stage of Manning’s career, it’s hard to imagine anyone making a move for the former Super Bowl MVP, but if anyone is going to do it, it may as well be the Jacksonville Jaguars, where Manning would be reunited with the Jaguars’ Vice President of Football Operations and former Giants Head Coach, Tom Coughlin. With a move away from the Big Apple, the Giants could continue their ride towards to a top-three pick in the 2019 NFL Draft and their subsequent quarterback of the future, while Manning could get away from a perennially porous offensive line that has allowed pressure on 35.8% of his dropbacks this season – the sixth-highest mark among quarterbacks. Through seven weeks, Manning has accumulated an 86.6 passing grade, an 82.4% adjusted completion percentage and a 106.6 passer rating when he’s thrown from a clean pocket, all of which better the marks of Jaguars incumbent Blake Bortles – so believe it or not, Manning would actually be an upgrade for the 3-4 Jaguars. Only eight weeks into a 10-year career, Raiders coach Jon Gruden has made it clear he’s prepping the roster for Las Vegas – not Oakland. As such, trading away premier talent for potential (draft picks) has been (i.e. Khalil Mack, Amari Cooper) and will continue to be a priority for Gruden. And Kelechi Osemele may be next in line. Jason La Canfora mentioned the 29-year-old Osemele as a possible trading chip prior to the Oct. 30 trade deadline, a chip well-worth a second-round price tag given his high-end production. Among the 60 NFL guards with 150 pass-block snaps this season, Osemele ranks tied for second behind Chicago Bears’ Eric Kush in PFF’s pass-blocking efficiency metric at 99.1. He’s allowed just three total pressures on 172 pass-block snaps. Conversely, Bengals guard Alex Redmond has allowed more pressures (32) than any guard in football and ranks dead last among the same 60 guards in pass-blocking efficiency (94.0). The need is glaring, and the Oakland fire sale is on. It’d be smart for the Bengals to pull the trigger. 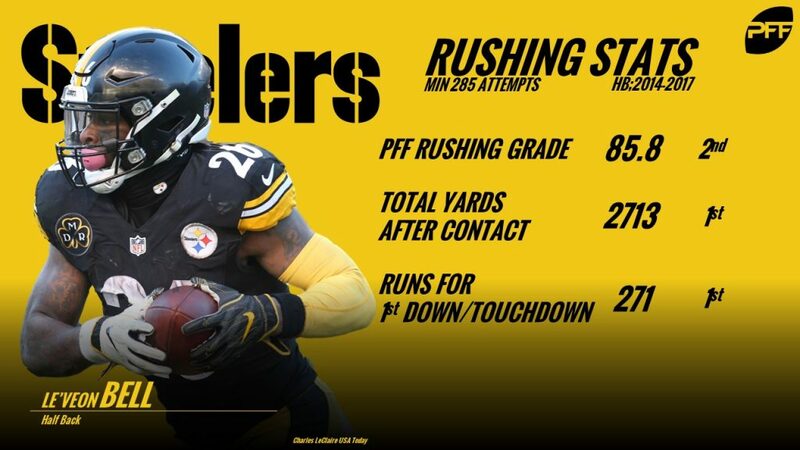 The relationship between Le’Veon Bell and the Pittsburgh Steelers has soured with his holdout this season, and with James Conner running the rock with high-end efficiency, Bell may have played his last down in Pittsburgh. Tampa Bay is one of the few teams in the NFL in desperate need of running back talent, as 2018 second-round pick Ronald Jones can’t find the field and Peyton Barber ranks 20th in rushing grade (63.9) through Week 7. A first-round pick is a hefty price for a running back these days, but the Bucs could surely use Bell’s playmaking ability, both as a runner and receiver, to jumpstart their offense in 2018. Plans change in this scenario, as Gruden takes first- and third-round picks to ship his starting signal-caller to the Jacksonville Jaguars. Carr has been a shell of himself since his career-best 2016 season was cut short due to injury, but he is still performing better than who the Jags have starting under center now. 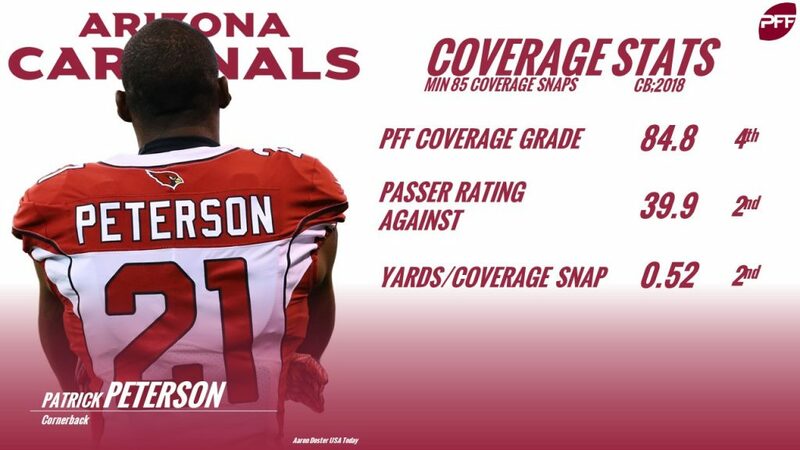 2017 first-round pick Haason Reddick can be a premier pass-rusher in this league but has fallen victim to poor scheme fit with the arrival of Arizona’s new regime. While the Patriots are 5-2, their 28th-ranked pass-rush unit has lacked firepower with Trey Flowers having the highest pass-rush grade among New England edge defenders with 100-plus snaps (73.0). Reddick is one of few edge players with an elite pass-rush grade (90.6), and those type of players aren’t found on the trade block too often in the NFL. There is a fire sale in New York right now, and Jenkins might be next on the list. The highest graded cornerback on the Steelers’ roster is Mike Hilton (70.4), who primarily plays slot coverage. After Hilton, you have a plethora of corners graded in the 58.0-63.0 range, average by PFF’s standards. Though the 29-year-old Jenkins is in the midst of the lowest-graded season of his career (56.9), he is ill-fit for a rebuilding Giants’ roster. 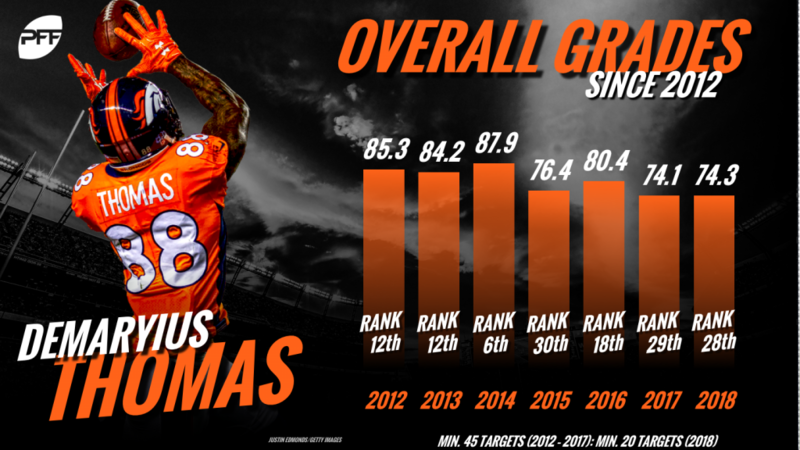 At Jenkins’ best, he is a top-10 graded corner (2016) and can surely be the player to revamp Pittsburgh’s 22nd ranked coverage unit with a change of scenery. Patrick Peterson has made it clear that he’s “100% focused on being apart of the solution” in Arizona, but the solution just might be to ship him off elsewhere. The Cardinals’ roster is far from talented enough to compete for a title in the near future, Arizona’s brass needs to bet on the future and gather picks to fix the deep holes. Peterson is having one of the best seasons of his career (83.4 overall grade) and well-worth a bevy of picks for a team chasing a Super Bowl in the next two seasons. The Kansas City Chiefs match the description well, as Patrick Mahomes has proven he can put enough points on the board to beat any team in the NFL. However, his defense and its 26th-ranked coverage grade through Week 7 isn’t doing him any favors. Peterson can step in as an instant upgrade over any of the Chiefs cornerbacks and make Mahomes’ job much easier down the stretch. Asking for a third-round pick in exchange for Parker was a hefty price tag earlier this season, but the trade deadline nearing could push the price down enough for the Browns to take a chance on the former Louisville wideout. Cleveland and their 31st ranked receiving unit are in the position to take a chance on Parker, who hasn’t played to his full potential in 38 snaps this season. The Browns may not be in a position to win it all this year, but John Dorsey should be comfortable pairing a sure-handed receiver in Parker with Baker Mayfield. Raiders’ 2017 first-round pick Gareon Conley played just 12 defensive snaps in Weeks 5 and 6 combined. Gruden has steered away from playing the former Ohio State phenom in favor of Dominique Rodgers-Cromartie, Leon Hall, and Daryl Worley. As such, it’s been rumored that his days are numbered in Oakland. New England can find comfort in betting a fifth-round pick on a former first-round pick in Conley, as the reward far outweighs the risk. Prior to being benched, Conley allowed just a 62.3 passer rating when targeted, ranking 11th among all cornerbacks with 100-plus coverage snaps this season. LeSean McCoy isn’t the same back that was traded out of Philly to the Buffalo Bills in 2015, but he still has enough left in the tank for the Eagles to opt for his return to the City of Brotherly Love. With Jay Ajayi out for the remainder of the season, Philadelphia has filled his shoes with a combination of Wendell Smallwood and Corey Clement. However, Smallwood hasn’t been nearly as productive, and Clement too is battling injury (quad). McCoy has earned a 68.1 respectable grade so far this season and could easily see an increase in production running behind a much better Eagles offensive line. Its crunch time for the Packers, as they enter Week 8 in a heated NFC North race where no team is under .500. Defensive interior Kenny Clark has picked up a large part of the slack rushing the passer, but they’ve struggled to generate pressure from the edge. Green Bay’s edge defender with the highest pass-rush grade who has played 200-plus snaps is Nick Perry (57.4). Jacksonville’s odd man out along the defensive line, Dante Fowler Jr., would have an immediate effect pressuring opposing quarterbacks with his 84.2 pass-rush grade. The former first-round pick is in the fourth year of his rookie deal and would be a steal for any team in need of one of the most valuable positions on the field. Deone Bucannon has played just 13 defensive snaps over the last three weeks, evidence that he’s no longer a priority player for the Cardinals’ defense. Though he’s had one of the worst starts to a season in his career (28.8 overall grade), the Seattle Seahawks may have the right pieces in place to get the best of Bucannon. Seattle has suffered injuries at safety and linebacker this season, taking some speed and versatility away from the defense. Bucannon can fill the void and a rotational depth player, and with a surplus of other talented players around, his strengths could again rise to the surface. It’s no secret the Atlanta Falcons’ defense, specifically the secondary, has been decimated by injuries. With Oakland’s fire sale fully ablaze, Atlanta can likely trade away pocket change for Keanu Neal lite, Karl Joseph. The 5-foot-10, 205-pound safety has flashed playmaking potential in bursts throughout his now three-year career, but he has since fallen out of favor with the Gruden regime and suffered injuries that will likely push him out of Oakland. He has only played 11 defensive snaps this season after playing 600-plus defensive snaps in his first two NFL seasons. Demaryius Thomas finds himself involved in trade rumors in a down season for the Denver Broncos. With Cortland Sutton coming along quickly, Emmanuel Sanders thriving and Thomas’ hefty cap hit (12.5 million this year, 17.5 million next year), the veteran wide receiver has become expendable for the right price. He has declined in receptions, yards, yards per reception and yards after catch per reception each of the last four years. He also struggles with drops, but still, his overall grade is a 74.3, which ranks 27th among wide receivers with at least 30 targets, and he’s averaging a modest 1.74 yards per route run. Philadelphia desperately needs another receiver to take the load off of Alshon Jeffery and Nelson Agholor and Jordan Matthews (53.6). The Eagles are the only team that really could be a competent receiver away from being very competitive in the playoffs, and they have about $10 million in cap space to make this work. Thomas can be cut next year for a $3.5 million cap hit to avoid his absurd $17.5 million salary. The Falcons’ season has not gone the way they expected, and players like Mohamed Sanu have become available as a result. The emergence of rookie Calvin Ridley hasn’t done him any favors, either. Sanu has generated a 69.2 overall grade on the season to go along with 13.5 yards per reception, which demonstrates that he can still contribute to a receiver-needy team. Sanu has had a passer rating of 133.9 when targeted, which is the fourth-highest mark among wide receivers with at least 30 targets. On top of that, Sanu has demonstrated an ability to move the sticks, as 16 of his 24 catches have gone for a first down this season. While the Browns aren’t contending this year, they aren’t doing their young quarterback any favors with the weapons around him at present. Cleveland ranks 31st in receiving grade, and no other receiver besides Jarvis Landry (70.5) has a grade of over 65. While Landry gets a lot of work from the slot, he hasn’t been as efficient in the slot has he been on the outside. The Browns have the most cap space of any team and can have Sanu, who is just 29, for an average cap hit of $7.65 million for the next two years.